So I skipped the Folger's and picked up Red Diamond Coffee (slogan: "The South's Finest Coffee"), then grabbed a bottle of Country Delite milk, bottled in Nashville. The baking supplies aisle had my usual brand of flour, Gold Medal unbleached, but I went for the package of Martha White (slogan: "Making Family Traditions Easy") because of the marketing message on the front of the bag: "If you grew up in the South on homemade cornbread and biscuits, you know Martha White stands for the finest tradition in kitchens across the south." On the side of the package was a recipe for pecan squares. OK then, local food! Back home, I fired up the laptop to find out more about my purchase. Unlike Betty Crocker and Aunt Jemima, who are made-up personalities, there really was a Martha White. She was the three-year-old daughter of a Nashville flour mill owner, Richard Lindsey. In 1899 he started to use her image on packages of his company's finest white flour. In 1941 Cohen E. Williams, also from Tennessee, bought the company, and gave the products a new slogan ("Goodness Gracious, It's Good!") Tapping into the musical tastes of the "biscuit-eating public," the company became a Grand Ol' Opry sponsor, and in 1953 started sponsoring a musical bus tour, the Bluegrass Express; the duo Flatts and Scrugg were the first act to tour. That tradition continues; perhaps you've heard of 17-time Grammy winner Alison Krauss, whom the company sponsored in 1996. 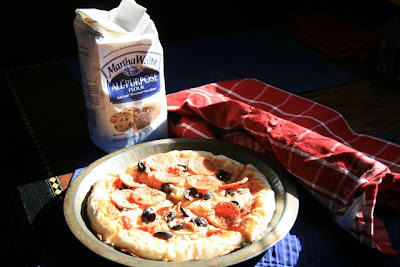 So I was NOT able to verify my hypothesis that Martha White flour is still made from locally grown and processed wheat. (Anyone know where to find that kind of info?) But foodies on the blog Roadfood have their doubts as to whether new Martha White is the same as the old Martha White, and a food writer on Chow.com asserts that, after Pillsbury bought Martha White, they reformulated it to be more like . . . wait for it . . . Gold Medal. Last night I ripped open the white and blue paper sack and made pizza for dinner. Maybe I don't have a discriminating palate. Maybe I was kidding myself. Maybe pizza is not the right vehicle for a test of the archetypal biscuit flour. But the pie still tasted pretty good. A couple other interesting factoids. First, Martha White flour, specifically the self-rising version, was the model for Garrison Keillor's Powdermilk Biscuits. Second, Martha While marketed the self-rising agent (baking powder, presumably) as "Hot Rize". 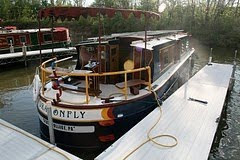 This name was adopted by a famous Bluegrass band (www.hotrize.com). It's not clear if Hot Rize wrote or performed the Powdermilk Biscuit song, but it seems possible because they frequently appeared on Prairie Home Companion in the show's early years. Cue "Twilight Zone" music. Must have been that public radio connection calling out to me from the supermarket shelf!